Three Thunderbirds were in action at the 2018 Payton Jordan Invitational on Thursday evening, a meet that features not only the top collegiate runners in the United States, but a number of professional runners as well. 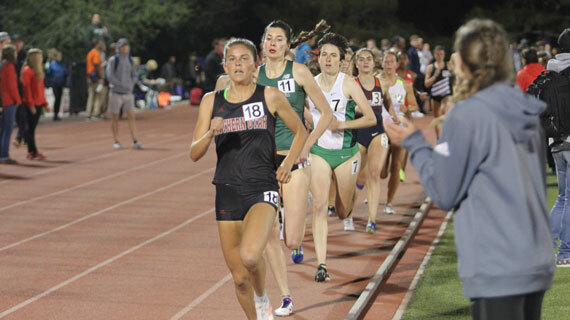 Sharlie Dimick started the night strong for Southern Utah, setting a new school record in the women’s outdoor 1,500-meter, running a 4:20.23. The previous school record was set by Sharla Manuele in 2010, which was an altitude adjusted 4:23.43. Her time also gave Dimick the heat victory. At the conclusion of her race she was 20th in the NCAA West Region and 41st in the entire NCAA in the event. Angie Nickerson improved on her Big Sky-leading time in the women’s 5,000-meter, finishing in a time of 16:16.60. That improved on her personal best of 16:19.85 that she set earlier in the season. In his first 5K of the 2018 outdoor season senior Mike Tate finished with a time of 13:53.12. Coming into the day, that mark would have put Tate sixth in the Big Sky Conference in the event. The Thunderbirds will now turn their attention to the Big Sky Conference Championships, which will run from May 8-11.